Central Laboratory of Genetic Engineering, Faculty of Science, Sohag University, Sohag, Egypt. alternative to other types of explants such as cotyledon, hypocotyl and leaf explants. the world—in the field, greenhouses and net houses . traits including high yield, stress and disease resistances. and induction of somaclonal variation . bility for further improvement via genetic manipulation. of somatic hybrids , and mass propagation . sucrose, without growth regulators, for seed germination. The medium was solidified with 8 g/l agar at pH 5.8.
was fulfilled on basal MS medium in 11 cm Petri dishes. were incubated at tissue culture rooms at 25˚C ± 2˚C. prerequisite for improvement of tomato plants. explants than from large ones [26,27]. Table 1. 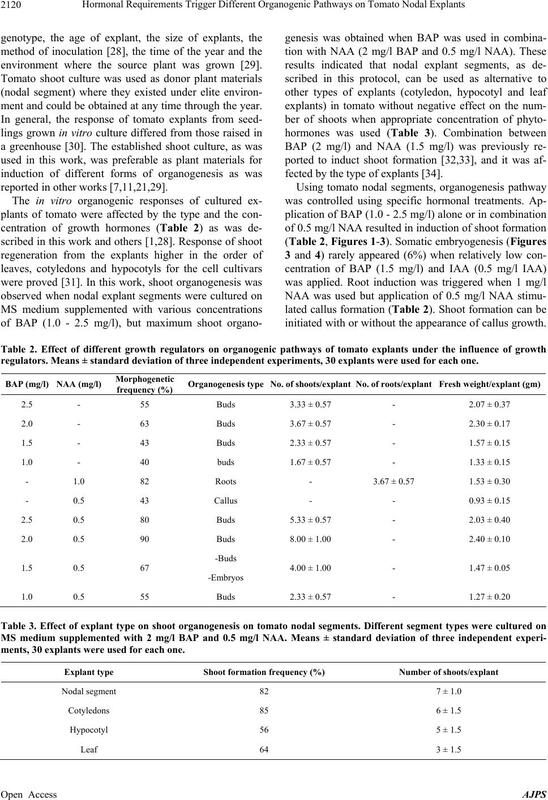 Effect of explant position on shoot regeneration. plants were used for each one. environment where the source plant was grown . ment and could be obtained at any time through the year. reported in other works [7,11,21,29]. fected by the type of explants . initiated with or without the appearance of callus growth. regulators. Means ± standard deviation of three independent experiments, 30 explants were used for each one. ments, 30 explants were used for each one. Figure 1. Shoot organogenesis on nodal explant segment cultured for 6 weeks on MS medium supplanted with 2 mg/l BAP. Figure 2. 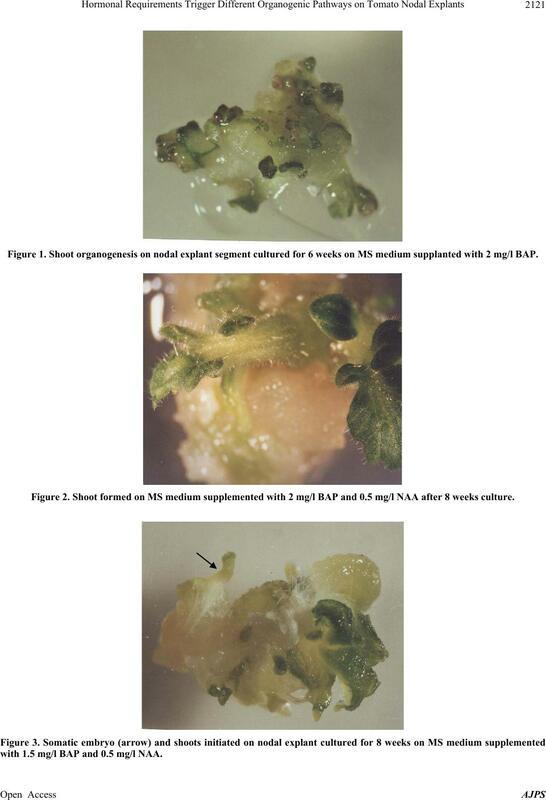 Shoot formed on MS medium supplemented with 2 mg/l BAP and 0.5 mg/l NAA after 8 wee ks culture . with 1.5 mg/l BAP and 0.5 mg/l NAA. Figure 5. 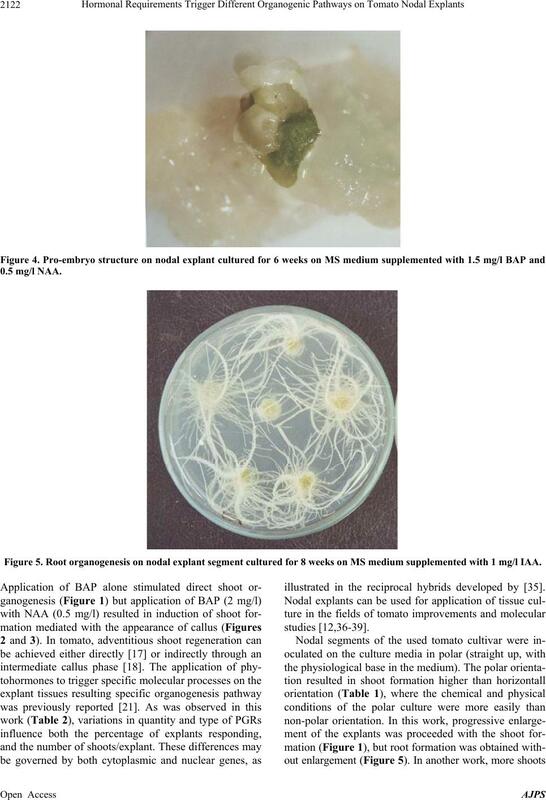 Root organogenesis on nodal explant segment cultured for 8 weeks on MS medium supplemented with 1 mg/l IAA. illustrated in the reciprocal hybrids developed by . three independent experiments, 30 explants were used for each one. 30 explants were used for each one. out the addition of auxins in the medium . No. 1, 2004, pp. 1-21. Academic Press, New York, London, 1971, pp. 337-482. American College of Nutrition, Vol. 19, No. 5, 2000, pp. P. Riso, F. Visioli, S. Grande, S. Guarnieri, C. Gardana, P.
Chemistry, Vol. 54, No. 7, 2006, pp. 2563-2566. 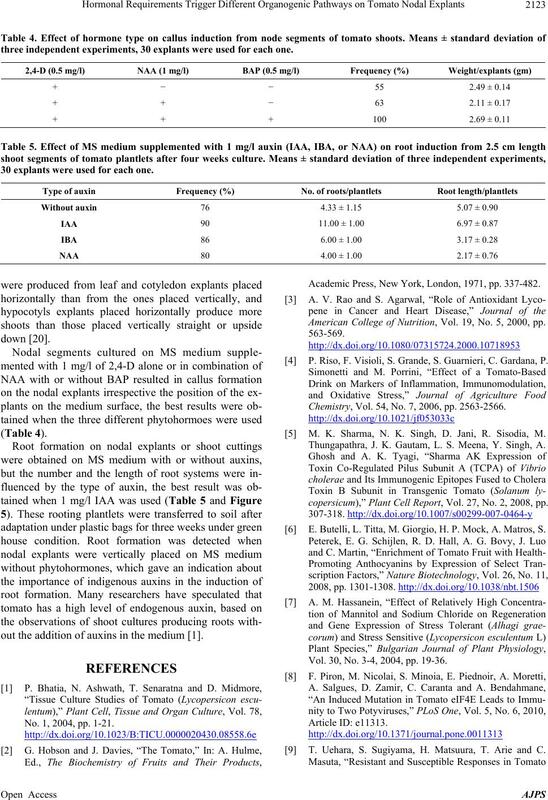 M. K. Sharma, N. K. Singh, D. Jani, R. Sisodia, M.
Thungapathra, J. K. Gautam, L. S. Meena, Y. Singh, A.
copersicum),” Plant Cell Report, Vol. 27, No. 2, 2008, pp. E. Butelli, L. Titta, M. Giorgio, H. P. Mock, A. Matros, S.
Vol. 30, No. 3-4, 2004, pp. 19-36. T. Uehara, S. Sugiyama, H. Matsuura, T. Arie and C.
 A. M. Hassanein, I. A. Ibraheim, A. 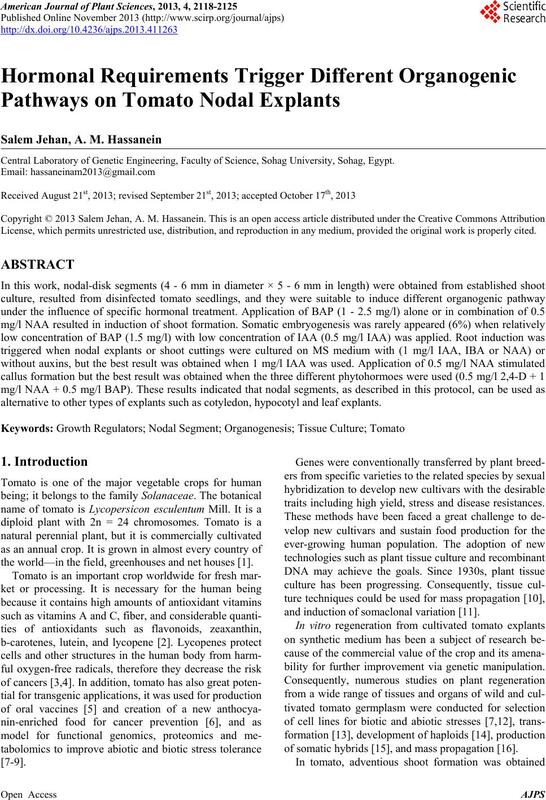 A. Galal and J. M. M.
Plant Biotechnology, Vol. 7, No. 3, 2005, pp. 175-181. Opinion in Biotechnology, Vol. 4, 2008, pp. 13-20. Vol. 133, No. 6, 1989, pp. 710-712.
port, Vol. 32, No. 9, 2013, pp. 1441-1454.
ment,” Czechoslovak Ac, 1984, pp. 241-242. M. Fari, A. Szasz, J. Mityko, I. Nagy, M. Csanyi and A.
 K. Dwivedi, P. Srivastava, H. N. Verma and H. C.
perimental Biology, Vol. 28, 1990, pp. 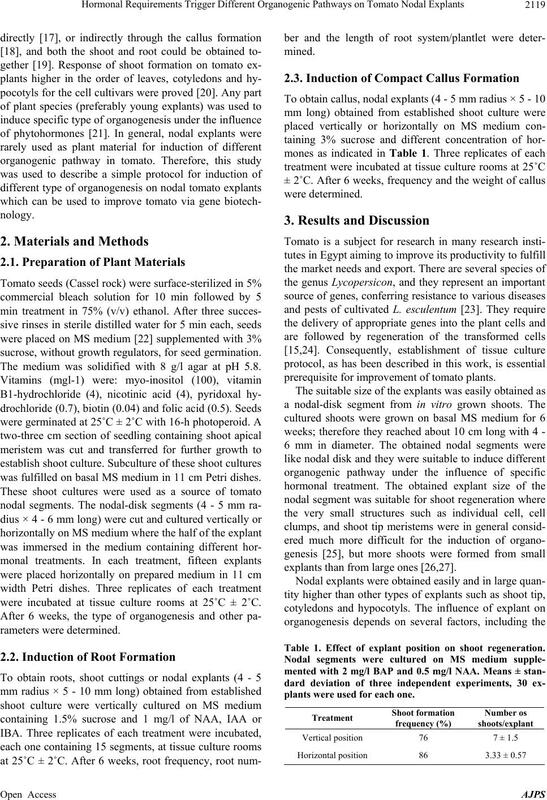 32-35.
mato in Vitro,” Acta Horticulture, Vol. 366, 1994, pp. Journal of Plant Biotechnology, Vol. 6, No. 3, 2004, pp. Verlag, Berlin, Heidelberg, New York, 1991, pp. 99-119. Berlin, Heidelberg, New York, 1991, pp. 39-43. Culture, Vol. 65, No. 1, 2001, pp. 31- 35. Vol. 17, No. 1, 1987, pp. 3-15. E. M. El-Farash, H. I. Abdalla, A. S. Taghian and M. H.
Vol. 5, No. 4, 2003, pp. 225-231.
physiologie, Vol. 102, No. 3, 1981, pp. 233-242. Biologia-Bratislava, Vol. 59, No. 3, 2004, pp. 405-408. Environmental Studies, Vol. 4, 2010, pp. 23-34. L. N. Liza, A. N. M. Nasar, K. M. A. Zinnah, M. A.
of Callus,” Journal of Agriculture and Sustainability, Vol. 3, No. 2, 2013, pp. 132-143.
ing & Practices, Vol. 4, No. 1, 2013, pp. 483-488. & Cell Physiology, Vol. 19, No. 1, 1978, pp. 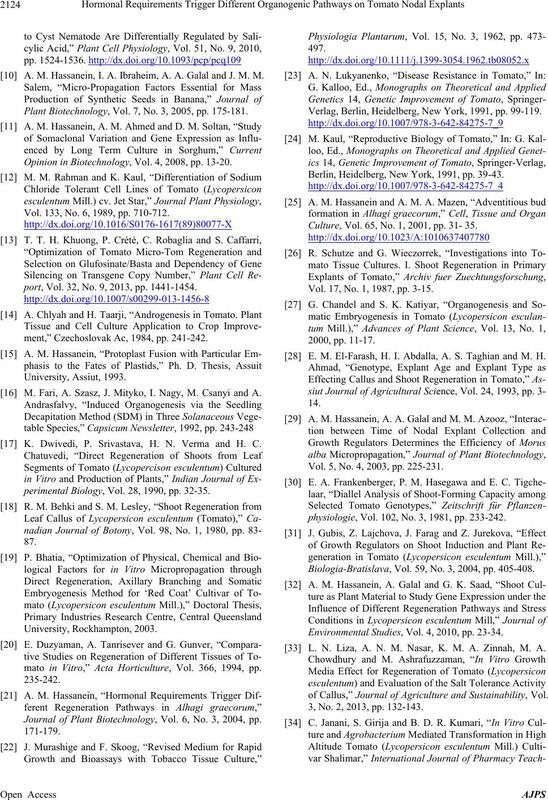 27-42.
tum L.),” Indian Journal of Plant Physiology, Vol. 38, No. copersicon chilense,” Breeding Scienc e, Vol. 48, 1998, pp. R. T. Faria, D. Destro, J. C. Bespalhok Filho and R. D.
mato Cultivars,” Euphytica, Vol. 124, No. 1, 2002, pp.